Field research institutions provide a window into a deeper understanding of trends and changes across multiple spatial and temporal scales of an ecosystem. 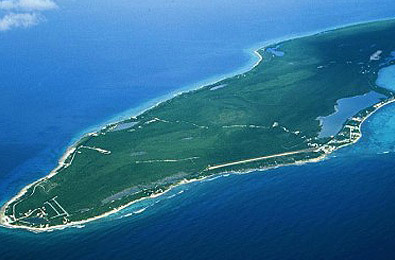 The Little Cayman facility has provided a resource for hundreds of visiting scientists and is a location where a long-term record of oceanographic and ecological data is available. Over the years, through an affiliation with NOAA, we have maintained a Coral Reef Early Warning System and we have continued to study the reef each year collecting ecological data to establish trends across the area. 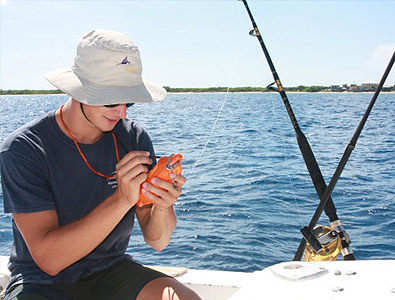 The CREWS provides CCMI with the opportunity to be at the forefront of coral reef science because it offers near real time information on the ocean environment around the robust reefs of Little Cayman. The project is led by the United States National Oceanographic and Atmospheric Administration (NOAA). CREWS gets its name from its success in modelling and alerting impacts on coral reefs from climate-related events such as, coral bleaching, seasonal upwelling, or approaching storms. This system is considered part of a NOAA Integrated Coral Observing Network (ICON) and is thus named ICON/CREWS. 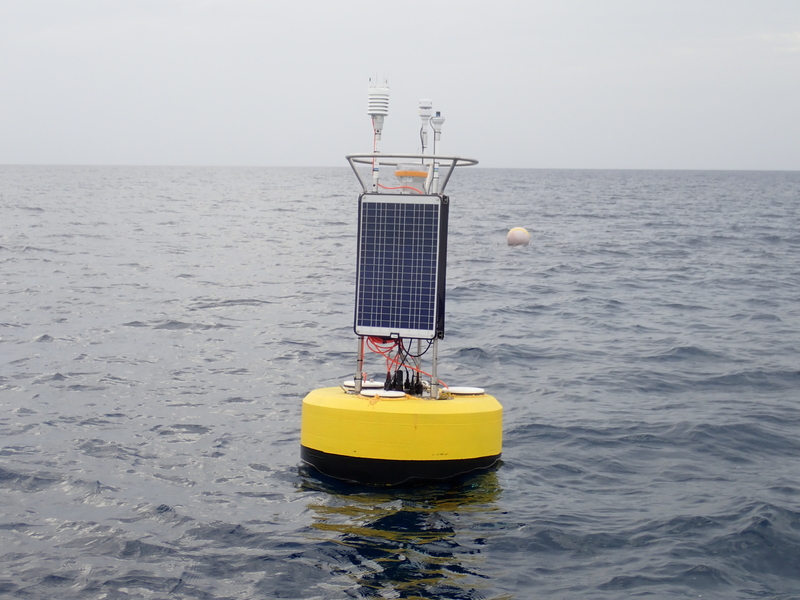 The CREWS buoy system uses local information about weather and marine conditions that is continually gathered by a series of monitoring stations and buoys located across the Caribbean Sea as well as worldwide. The data is transmitted in real-time to NOAA for integration and analysis, while also being made available online to researchers, policy-makers, and to the public. ICON uses the data collected by CREWS in conjunction with satellite data and radar technologies to analyse and forecast regional oceanographic and atmospheric trends. 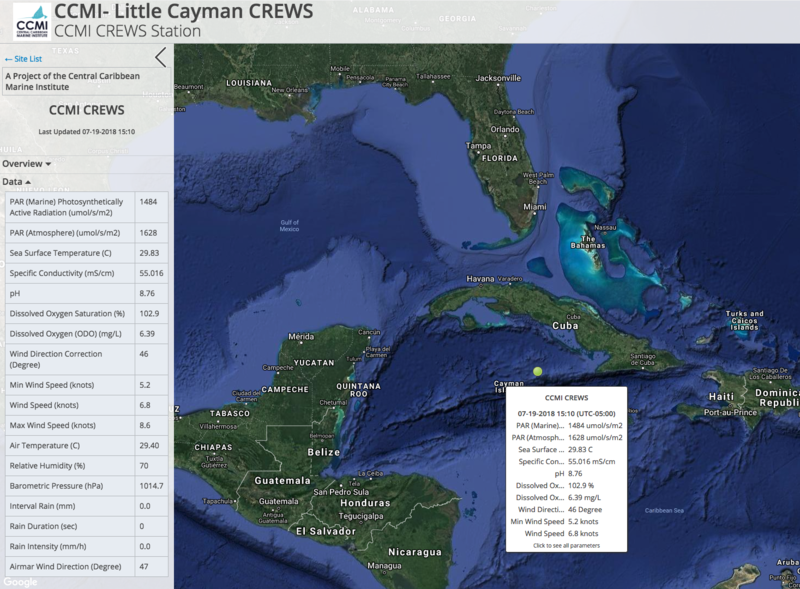 The CREWS system has been successfully used in modeling and alerts of coral bleaching conditions both locally in the Cayman Islands and the Caribbean Sea. Over time, it is NOAA’s intent to expand the CREWS system by installing stations in more geographic regions and to further refine the systems capability to better predict the impact of climate patterns on coral reefs. Originally installed in 2009, this monitoring location gave CCMI, the Cayman Islands, and the general public access to real-time weather information and records of local climate patterns over time. In October 2012, Hurricane Sandy unfortunately damaged CCMI’s monitoring system beyond repair. Almost one year later, a more rugged and robust monitoring buoy was installed in its place and remained in place until 2017, when recurring communications issues required it to be replaced. In June 2018, CCMI installed a new, modern, state-of-the-art oceanographic buoy on the north side of Little Cayman, thanks to funding provided by the Dart Foundation and the Edmund F. and Virginia B. Ball Foundation. Near real-time weather and ocean state information will be easily accessible from a mobile phone or computer. It contains a weather system and instruments to measure light (photosynthetically active radiation- PAR) and 5 instruments underwater measuring light (PAR), dissolved oxygen, conductivity (salinity), temperature, and pH. This is the first time that we are able to test for changes in the acidification of the seas surrounding Little Cayman. Ocean acidification is a major threat to biodiversity and has been linked to lower calcification rates in skeletal organisms and poor larval development. The new CREWS includes an Acoustic Doppler Current Profiler (ADCP) which will measure the movement of water traveling across the reef system. Understanding currents will help direct future work to understand the replenishment of fish and corals as they spawn near our marine protected areas. Current conditions are available to view online and via mobile app. For information on how to access historical and detailed data from the CREWS buoy, send us an email. The CREWS Dashboard system is a graphing tool which CCMI has developed for researchers, students, and citizen scientists to create their own “dashboards” using the environmental data collected by the CCMI CREWS buoy. More data will be available in the future. Coral reefs are the largest mass of construction workers on the face of the earth. They are natural architects in the shallow sea but only remain productive when juvenile corals are able to survive after recruitment onto the reef. At every dive location on the reef around Little Cayman, we see evidence of recruitment. This is a good sign for the future. Using the AGRRA, Atlantic Gulf Rapid Reef Assessment protocol and collecting additional recruitment data, this project investigates the potential for juvenile corals to survive and replenish the local reefs. Results from this work will help generate an understanding of the mechanisms that are driving reef resilience. AGRRA data on the benthic habitat and fish populations surrounding Little Cayman has been collected regularly since 1999. As CCMI researchers continue to collect this data annually, notes, reports, and peer reviewed journal articles are available online to scientists, policy-makers, and the general public.